The “patio”, any “patio” (courtyard )responds to a basic scheme over which a number of variants can be superimposed, depending on the architectural style to which it belongs. However, the patio (courtyard) has always had an entrance gate or ‘portal forà’ over which the family coat of arms rarely appeared, but did which appear in the interior, on the gallery balcony, on the capitals of the columns, over the gates of the rooms. This gate gave access to the ‘pas d’entrada’ or entranceway, a portico, which is a covered space situated between the ‘portal forà’ and the open patio. This ‘pas d’entrada’ also evolved through time from an initial narrow passageway in Gothic patios (courtyards) to greater width. The paving was also made differently. From the end of the XV century, sculpted study access gates appeared. These are gates that provide access to private rooms belonging to the owners of the house, where the library or the filing room was located or commercial transactions carried out. The entranceway leads directly to the open patio (courtyard), leading via the stairs to the building’s service area and from where one also accessed the storage rooms, places for all the products needed by the house and in some cases for goods that were sold. Thus, the patio (courtyard) was a space that saw a great deal of domestic and at times commercial activity when the house was owned by a family of merchants, and at the same time, a space where business connected to the wealth of the owner was carried out. The patio (courtyard), apart from protecting the intimacy of the inhabitants of the house, was at the same time a semi-public place that could be freely used by neighbours without the need to seek permission. They offered water and shade during the summer, a roof on rainy days and space for children’s games, for social gatherings and courting. The patio (courtyard)was a way in which to communicate the most important family events to the neighbours. When the door to the patio was half-closed, this announced the death of a resident. If the gate was wide open and adorned with flowers and plants, this announced the birth of a child. Take a walking tour through Palma old town, and discover with Mallorca Private Tour guides the way of living of the majorcans, the curiosities and secret stories of the courtyards and the families who lived there. A fabulous trip to the past with our knowledgeable Tour guides which will let you with no words. Let us be your Guide and we will take you to an amazing walking tour to discover the real Palma and the way of living before touristic boom started. Palma old town, a city to discover with Mallorca Private Tour guides. No worries, far away from crowed places, just relax and enjoy your patios (courtyard) tour with Mallorca Private tour guides, an experience no to be miss, a must see. 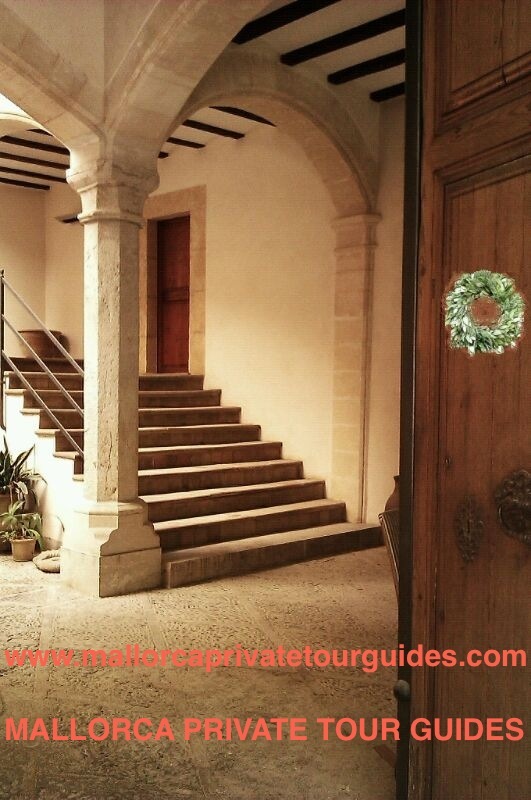 This entry was posted in Mallorca Legends and stories, Palma City, Palma de Mallorca Port & Cruises and tagged architectural, arms, coat, coat of arms, courtyards, fora, gothic, guides, majorcans, mallorca, must, old, old town, palma, patios, portal, portal fora, portico, private, see, stories, style, tour, town, walking. Bookmark the permalink.